Just half a year after it allowed users to send up to 100 MB of attachments, it has now increased the mail limit to a whopping 1 terabyte. Yahoo Mail has gone through yet another transformation. Just half a year after it allowed users to send up to 100 MB of attachments, it has now increased the mail limit to a whopping 1 terabyte or 1,000 GB. As David McDowell, Senior Director of Product Management for Yahoo Mail, told Business Today in a telephonic interaction from the US, "that will take an average user 6,000 years to use up. It is more than what anyone would ever need." This 1TB of storage will complement the 1TB of storage space available on Flickr, Yahoo's photo and video hosting service. There is another similarity to the Flickr revamp some months ago. 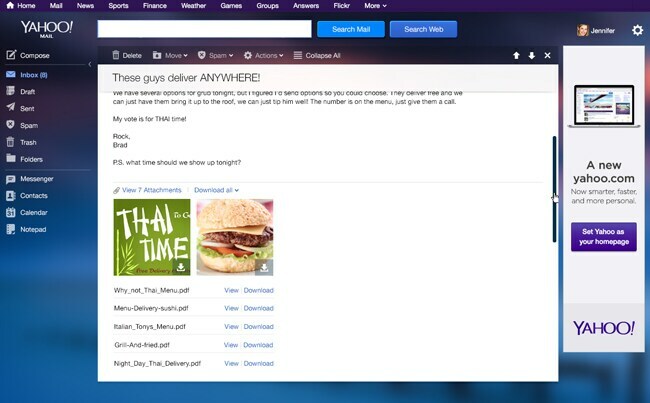 Yahoo has made all premium features of its mail - like the extra storage, disposable email addresses and free mail forwarding - free for all users. New Mail Plus users will now have to pay $49.99 per year, for what will be reduced to an add-free experience only. Earlier users will continue to get this for $19.99 per year. "We see this as providing more benefits to free users. 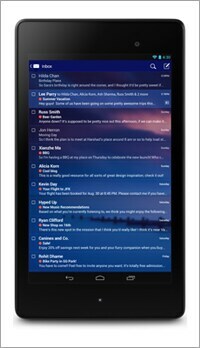 The premium users are just a relatively small number," explained McDowell. 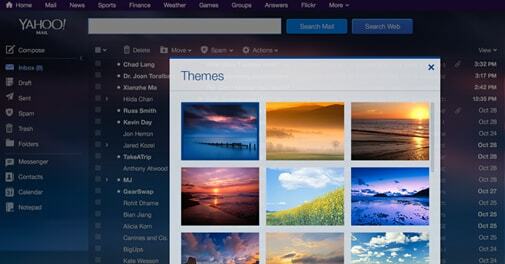 Yahoo has also introduced new themes where users will be able to have 24 Flickr backgrounds to their mail. The rest of the mail experience, especially the colours, will change according to the theme. 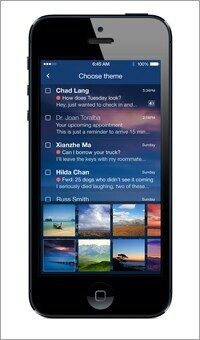 This new feature draws heavily from Yahoo's award winning weather app with a glass effect and cleaner fonts. The compose, meanwhile, will remind users of the clean business-like interface of Tumblr. Once a theme is selected it will sync across all your devices. 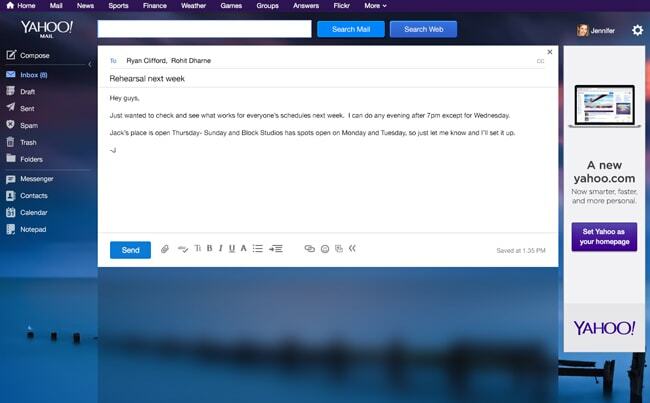 Adding to the ease of navigation, users will now be able to collapse the left bar and get more space for mail. 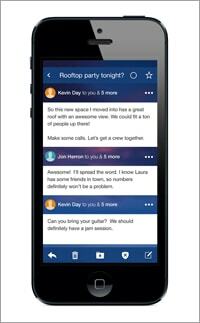 The bar, when visible, will let them toggle between different tools like Yahoo Messenger and contacts. Hovering the cursor over a mail will show options like search and delete, while a click will expand it to show related messages in the thread. The thread is a new feature that seems influenced by Gmail, Yahoo's main competitor. Within a mail, users will be able to view previews of attachments without actually opening them. Even PDF and Microsoft Office files will be available for preview within the mail. There is also a quick reply just below, with the box increasing in size as you add content. The rollout of the new mail and the updated apps for iOS, Android and Windows Phone are on and expected to cover the globe within a few hours. Indian users were still on the old mail template at the time of filing this report.